Juvederm Ultra and Juvederm Ultra Plus are stabilized Hyaluronic acids used for soft tissue augmentation and smoothing out wrinkles and folds. They are FDA approved for improving the smile lines, also known as parenthesis lines or nasolabial folds. The smile lines are the most noticeable signs of aging and Juvederm Ultra has been used for many years successfully in treating this area. The treatment takes a few minutes and the results are immediate. The procedure is practically painless and overall tolerated very well by everyone. The result is a naturally younger and more youthful look. Dr. Behnam loves to teach and is the first thing you will notice when you come in for a consultation with him. Dr. Behnam wants all of his patients to learn and be educated about the various products he uses for facial rejuvenation. Below is a list of questions and answers about Juvederm Ultra and the other Juvederm family of products. 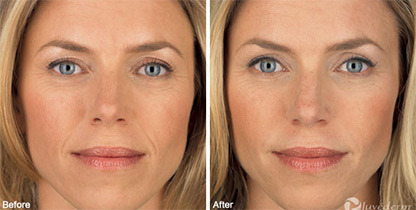 Juvederm Ultra is stabilized Hyaluronic acids used for soft tissue augmentation and smoothing out wrinkles and folds. Juvederm Ultra is FDA approved for improving the smile lines, also known as parenthesis lines or nasolabial folds. No allergy or collagen testing is required and the procedure typically takes a few minutes. How does Juvederm Ultra differ from Juvederm Ultra Plus? Juvederm Ultra is a finer molecule and is used to treat lips and fine wrinkles. Juvederm Ultra Plus is a thicker product that is used for deeper folds and more severe wrinkles, like the parenthesis lines around the mouth. Juvederm Ultra Plus is similar to Perlane; both are intended for deeper and more severe wrinkles and folds. They both also last about 9 to 12 months. What areas are typically injected with Juvederm Ultra and Juvederm Ultra Plus? Juvederm Ultra can be injected in many areas on the face, depending upon experience and expertise. Dr. Behnam uses the latest techniques and injects multiple locations on the face to give a more youthful appearance. Below is a list of areas that Dr. Behnam uses Juvederm to rejuvenate the face. Smile lines: Also known as parenthesis lines or nasolabial folds, this is the most common area that is injected with Juvederm Ultra or Juvederm Ultra Plus. As we age, we lose fat and muscle around the mouth, thus leading to the development of hollowness around the mouth. These areas are injected to fill and smooth them, giving a much more youthful appearance within minutes. Mild to moderate lines are injected with Juvederm Ultra while deeper and more severe folds are injected with Juvederm Ultra Plus. Marionette Lines: Hollowness at the angles of the mouth is known as Marionette lines. Improving the appearance of these areas will significantly enhance the aesthetic look of a person. Typically, the Marionette lines are injected at the same time as the parenthesis lines around the mouth. Patients love the results because it instantly removes years off the face. Lips: Juvederm Ultra is used to augment and plump the lips. Natural lips abide by a certain rule of thumb: the lower lip is typically larger than the upper lip. When injecting the lips, this rule must be maintained. Dr. Behnam’s philosophy is that lips must look natural and bigger does not necessarily look better. Lips, just like everything else on the face, must be balanced with the rest of the face. In fact, when Dr. Behnam teaches other physicians and residents, this is the most important concept that he preaches: Lips must look natural. When analyzing lips, there are several aspects that must be evaluated. The lip has 3 important characteristics that are aesthetically very important. The lip: As we age, we lose substance in the lip itself and the lip deflates. Thus, injecting and plumping the lip will give patients a younger look. The Vermilion border: Secondly, there is the lip lining, also known as the vermilion border. As we age, the vermilion border thins out and in some patients it practically disappears. The loss of the vermilion border results in lip gloss and lipstick smudging around the mouth. The Philtrum columns: Finally, another important characteristic of a younger looking lip are the philtrum columns. One could pick up a New Beauty magazine and look at a lip of any young person. One characteristic that always stands out is the two columns on the upper lip below the nostril, also known as the philtrum. You might say why is this important? Well, the philtrum unconsciously signals the brain that you are looking at a younger more beautiful face. Thus, when Dr. Behnam analyzes the lips, the goal is not just to make the lip plumper and larger. It is the combination of injecting the appropriate amount of products in the lip in order not to make it too large, preserving the exact ratio of upper to lower lip, creating and augmenting the philtrum columns and improving of the vermilion border. This combination will give your lips a naturally younger appearance. Acne scars There are many different treatment options for acne scars, including chemical peels (Jessner’s Peel, TCA Peels, CROSS technique), Fractional CO2 laser, subcision, punch excision, saline injections and fillers. Juvederm Ultra can be used to fill in depressed scars. The results are instantaneous and impressive. Juvederm Ultra is typically used, as opposed to Juvederm Ultra Plus which is a thicker material. The area is cleansed and Juvederm Ultra is injected directly into the depressed scar at the appropriate level within the skin, which raises the scar. Frown lines: Frown lines, also known as 11′s or glabellar lines, can be treated in a variety of ways. Neurotoxins, like Botox and Dysport are the first line of therapy. Once these two products are maximized, then the areas can be injected with Hyaluronic acids, typically Restylane. Small aliquots are injected, and sometimes over several sessions. Radiesse, Sculptra or other products are not recommended for the frown lines. Pre-Jowl sulcus: As we get older, we lose fat, muscle and bone, particularly in the pre-jowl area. Pre-jowl sulcus is defined as the hollowness or depression seen on the jaw line in front of the jowl area. This is one of the tale tale sings of aging. The depression in the pre-jowl sulcus will make the jowl look worse than it is. The area is easily and satisfactorily injected with Juvederm Ultra Plus. The results are so remarkable that patients jump in joy after this injection. Juvederm Ultra Plus is injected over the bone and then pressed into place. It can also be injected in the subcutaneous fat area as well to give a great result. Other fillers, such as Radiesse or Perlane, can do the same job as well. Tear Trough areas: The tear trough area, technically known as the nasojugal fold, is the normal anatomic depression that exists between the side of the nose and rim of the orbital bone. As we age, we lose fat in the upper cheek area and the hollowness makes this natural depression a lot more noticeable. The tear trough depression in combination with the sagging of the upper cheek muscles creates hollowness underneath the eye, thus known as dark circles. This is one of the most noticeable areas in peoples face and one of the most satisfying areas to inject. Due to various reasons, the general contention is not to use Juvederm in the tear trough areas. Dr. Behnam uses Restylane with great success in this area to achieve great results. Cheekbones: As we age, we lose fat, muscle and bone in the upper cheek areas. In addition, gravity over the years takes its toll on the cheek muscle, and they start to sag downward. Thus, older individuals lose the cheekbone, which disrupts the natural Triangle of Beauty on the face. Cheekbones may be injected with a variety of different materials, including Juvederm Ultra Plus, Radiesse, and Sculptra. Juvederm Ultra Plus is typically injected over the cheek bones, which lifts up the muscle of the cheek, creating a younger appearance. The cheek bones can be injected medially and laterally, depending on where correction is needed. To understand the importance of cheekbone anatomy, it is important to understand the significance of the Triangle of Beauty. If you draw a horizontal line between the two cheekbones and then connect it to the chin, this creates the Triangle of beauty. As we age, we lose this triangle of beauty. The importance of cheek injections is that it recreates the Triangle of beauty. Earlobes: Earlobes can be injected using Restylane and Juvederm. Small amounts are placed in the earlobe, making them bigger. The significance is that when you wear diamond stud earrings, bigger earlobes push out the earrings more, thus making them look bigger. Eyebrows: Injection of Juvederm Utra in the upper portion of the eyelid and/or near the eyebrow will raise the eyebrow, instantly. This technique in combination with Botox will raise the lateral brow, creating a beautiful curve. I need a brow lift, can Juvederm Ultra help? Yes. Juvederm Ultra can be injected to lift and raise the eyebrows instantaneously. Juvederm is injected laterally and then the eyebrows are pushed upwards. This gives an immediate lift. This process can also be combined with Botox or Dysport as well. How can I make my diamond studs stand out more? Juvederm Ultra can be injected into the earlobe to make it bigger. When wearing diamond stud earrings, it will push out the earrings more, making it more obvious and bigger. How can I get rid of the droopy angles of mouth? The downward angles of mouth can be corrected by a combination of Juvederm Ultra and Botox. Juvederm Ultra is injected at the corners of mouth and in the Marionette lines. This technique eliminates the Marrionete lines, the dark shadows under the lips and straightens the mouth corners. The Juvederm Ultra injection takes effect immediately. The Botox is injected in a special muscle around the mouth known as the Depressor Anguli Oris. This muscle acts to pull down the angle of the mouth. By slightly immobilizing it, it stops pulling down at the angles of mouth. The combination of Botox and Juvederm works great at straightening the corners of mouth. I dislike the smile lines, how can Juvederm Ultra help? Yes, Juvederm Ultra and Juvederm Ultra Plus can be injected in the smile lines around the mouth to fill them in and smooth them out. Injections take a few minutes and the results are immediate. Juvederm Ultra lasts anywhere between 5 to 6 months to a year, depending on the person. How are the Juvederm injections performed? The area is first prepped with alcohol and topical numbing medication is applied. After 10 to 15 minutes, the area is cleansed with alcohol again and the area is injected with Juvederm Ultra. Most people don’t feel any pain. The procedure is quick, taking about 5 minutes to inject the areas desired and overall tolerated very well. The results are immediate. Patients are amazed at how 5 minutes can change the way they look. The lines look smoother and overall they look younger, naturally, in a matter of few minutes. Typically, the injections are tolerated very well by most people. The area is numbed with topical numbing medication. Our numbing medical is a combination of three numbing creams, giving it a very powerful anesthetic property. In addition, the Juvederm Ultra XC also has numbing medication pre-mixed with the Hyaluronic acid, thus making the procedure even more tolerable. What are Juvederm Ultra XC and Juvederm Ultra Plus XC? Juvederm Ultra XC and Juvederm Ultra Plus XC are the latest inventions from Allergan. These products combine the same proven stabilized Hyaluronic acids as in the regular Juvederm Ultra but combined with the numbing medication Lidocain. They are as smooth as the regular Juvederm Ultra line and the results look as natural. The benefit is that Juvederm Ultra XC and Juvederm Ultra Plus XC are better tolerated since they are premixed with numbing. They can be used in all the areas that the regular Juvederm Ultra and Juvederm Ultra Plus are usually injected. Where can I find Juvederm injection in Santa Monica and Los Angeles, California? Dr. Behnam, U.S. leading dermatologist and recognized nationally by Newsweek as top 10 Physicians and Surgeons in the US, is a Board Certified Dermatologist practicing in Santa Monica, Ca. Dr. Behnam is an expert Juvederm injector in Santa Monica, Los Angeles California. Dr. Behnam’s office location is close to the freeway, thus he serves everyone in the Santa Monica area, Pacific Palisades, West Los Angeles, Beverly Hills, Culver City, West Hollywood and the greater Los Angeles County. No two people are alike and not all fillers are the same. Every individual needs a customized plan depending upon what their needs are. Dr. Behnam is a board certified dermatologist recognized nationally by Newsweek as top 10 Physicians and Surgeons in the US, with appearances on The Doctors Show, Good Day LA and ABC News. Dr. Behnam is an expert in advanced techniques of Juvederm injections. Please see Dr. Behnam in his Santa Monica office for a complimentary consultation so that he can explain where the Juvederm should be injected to give a you a more refreshed and youthful look. Is the consultation complimentary with Dr. Behnam? Yes. Cosmetic consultations are at no charge. You are welcome to meet Dr. Behnam. He will sit down with you, analyze your skin, discuss the various options and explain how the procedures are performed.